Airing now once a week on Wednesdays on the Blog radio, and in the Archives thereafter for free listening, The Connection featuring Nancy has broadcast or recorded the following information packed shows for the month of March. For those unable to listen to audio on their PC's, the scripts for the various shows become available as links from the ZetaTalk Media page as soon as the show airs. Currently available for the shows for Mar 1, Mar 8, Mar 15, Mar 22, Mar 29. Mar 1 - Decapitation, Demise of the Bush Administration Determination of Bush & Co to secure the White House in 2000, Supreme Court fiat, Gore winning the popular vote. Relationship to expected arrival of Planet X in 2003. US Military revolt against Bush, removing football August 2003. Precedence during Nixon era. Navy hanging with Bush, thus Bush forcing resignations in the military and assignment of Admiral to Northcom. Subsequent Navy revolt. Kerry desired by Puppet Master due to military background, hoping to bind the military to again to the US. Puppet Master rage when 2004 election fraud kept Bush in power. How vote fraud is accomplished and leaves no trail. Reasons for Kerry's concession. Puppet Master revenge via economics, Federal Reserve rates, and leaks such as Downing Street, CIA redition, Plane affair, NSA spying. Likelihood of Martial Law called by a panic stricken Bush, and likelihood of success. Mar 8 - Aftertime - the Hours, Months, and Years after the Pole Shift Choas in the hours after the pole shift, regardless of planning. Role of action lists to direct anger and anxiety. How the Y2000 crisis relates to the coming pole shift. Taking advantage of all the rotting bodies. Migrating germs. What to do when emergency services are overwhelmed by the injured. When, how, and why rotation of the globe restarts. The new geography, and how this is affected by melting poles. The new N Pole, and the magnetic/geographic alignment anticipated. How the worlds deserts will be affected by the climate changes. How plans for Martial Law or a carryon government will play out. How the elite bunkers will fare, and what this means for survivors. How vegetation and wildlife adjust to a climate change. Volcanic dust, and the new prevailing westerly winds. Whether a nuclear winter scenario will emerge. The best planned survival community with hydroponics and wind and water power and carbon arc lamps. The likely survival community eating bugs or chicken and fish and low-light gardening endeavors. Mar 15 - Global Quakes, What the USGS Won't Address Onset of global quakes in March, 2003. What constitutes a global quake, characteristics, number of countries participating, relationship and timing of earthquakes. USGS answers to queries, avoidance of the issue utterly. USGS dumbing down the Richters, and evidence that this is going on. 12 hour wobbles and blobbles preceeding or after a global quake, and the cause. How magma surges contribute. Relationship and timing of volcanic activity to global quakes. Yellowstone and New Madrid seismograph 12 hour signatures. How and why the Atlantic Rift acts like a magnet on the surface of the Earth. Relationship of this magnet to the global quakes, and continental rip. Sweeping arms of the Sun and the whiplash or ricochet they cause between the Earth, Planet X, and the dark twin of Earth. Dramatic increase of volcanic activity since 2003. How the Earth's crust shatters, and affects civilization. Rotation stoppage in folklore, and how this relates to global quakes. Mar 22 - Oashpe, a True Channeled Book When and where written. Topics covered by the Oashpe with parallels to ZetaTalk. Planet X termed the Red Star. Description of orbit and magnetic effect on the Earth. What happened to Atlantis, and how the demise of Atlantis was assisted. The Kosmon era, intended from the start for the Earth. Aliens in attendance, both good and bad by nature. Grades of spirits, from infantile to angelic. How the spiritual ranks interact with each other. Crowded incarnations, ghosts, and possession. How Columbus was assisted to locate America, and how the Constitution was assisted in its birth. The role of those who had been killed during the Inquisitions. Organized religion and politicians, how these become corrosive. How contactees are inspired. God's work by good deeds, not by words. The time after the pole shift, and the formation of new communities. What trades and professions will be continued, and which discarded. Mar 29 - The Power of the Caring Heart Why Service-to-Other communities fare well, and how they compare to Communism, Capitalism, and communities guided by organized religion. Examples on Earth. How to identify a Service-to-Other person, and characteristics of the spiritually immature. How actions, and preparations for the coming pole shift, show spiritual maturity or immaturity. How the caring heart is guided during troubled times, for greater success. The role of contactee groups, or behind the scenes meetings on space ships. How contactees are being guided to meet each other and migrate to safe locations. Relationship of the Star Wars trilogies to the current Bush administration end times games. How Service-to-Other communities will deal with the selfish or lazy, and techniques that work best. Under what circumstances zeta/human hybrids will become neighbors, and share their technology. Factors that prevent technology sharing, or enhance the likelihood. The perpetual power pack, and how to interface with such a gift. A Continent Splits Apart [Mar 15] http://www.spiegel.de/ 'Normally new rivers, seas and mountains are born in slow motion. The Afar Triangle near the Horn of Africa is another story. A new ocean is forming there with staggering speed -- at least by geological standards. Africa will eventually lose its horn. Geologist Dereje Ayalew and his colleagues from Addis Ababa University were amazed -- and frightened. They had only just stepped out of their helicopter onto the desert plains of central Ethiopia when the ground began to shake under their feet. The pilot shouted for the scientists to get back to the helicopter. And then it happened: the Earth split open. Crevices began racing toward the researchers like a zipper opening up. Normally changes to our geological environment take place almost imperceptibly. A life time is too short to see rivers changing course, mountains rising skywards or valleys opening up. 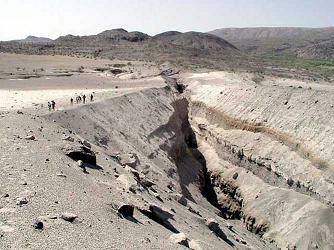 In north-eastern Africa's Afar Triangle, though, recent months have seen hundreds of crevices splitting the desert floor and the ground has slumped by as much as 100 meters (328 feet). At the same time, scientists have observed magma rising from deep below as it begins to form what will eventually become a basalt ocean floor. Geologically speaking, it won't be long until the Red Sea floods the region. The ocean that will then be born will split Africa apart.' [and from another source] Stretching results in quakes, as the plates underneath, in layers like flaky pie crust, release. Stretching results in land not supporting prior buildings or roads or bridges, which suddenly collapse. Stretching also results in volcanoes oozing more lava, or if the skin of the Earth thins, an explosion. This could occur in all those areas we have listed as expected to rip greatly: Red Sea, African Rift, etc.